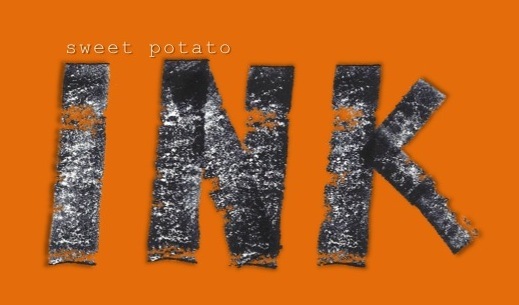 Today’s order: potato topped with ink, with a side of creativity. We were out of regular potatoes, but I had a budding sweet potato in the basket. So I hacked out a couple simple shapes, inked them up, and formed one short word. As I played, it occurred to me that Sweet Potato, Inc. would be a fun brand name. Hmm. What creative enterprise could I invent to go with that?